Kemi Adegoke describes the complex issues of what she describes as "The culture of low expectations" in inner city British schools. I said I wanted to be doctor, but they said: "Have you considered nursing?" She says she went into politics because she was angry. Angry about education and angry about international development. 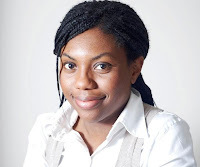 Adegoke was born in Wimbledon although lived in Nigeria until she was 16, she now lives in Herne Hill ward within the Dulwich and West Norwood constituency. In her talk she takes us through her amazing forray into politics and how she suddenly became one of the leaders of policy formulation on Africa in the British Conservative Party.